Pyle and Kenfig golfer William Pontin made it two wins on the bounce with a fantastic 63 points in the U12s section of the Ping Welsh Junior Tour event at Abergele. 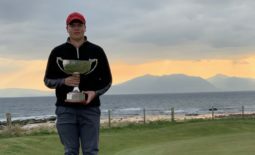 Chairman of Championships for Wales Golf, Ashton Bradbury said, “That was a great score from William which capped off a tremendous day at Abergele Golf Club. Chasing William hard in second place was Ethan Langley from Rhondda with 62 and Harry Ledsham in third with 59. William’s two recent wins combined with his strong performances from earlier in the season see him claim first place in the U12s Order of Merit for 2018. 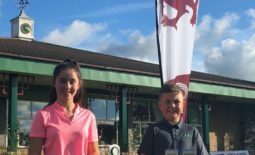 In the U14s age group, Penmaenmawr’s Ryan Williams enjoyed a sparkling Junior Tour debut with 41 stableford points – just enough to edge Cardigan’s Dwynwen Holgate, also with 41 points, into second place. Three players tied at the top of the U10s with 58 points, with Reuben Baker, a regular winner in the U8s last season, getting the nod to secure his first win in the U10s age group. 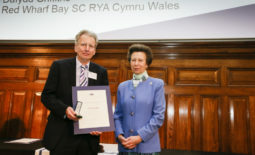 George Ledsham from Mold was the runner up for the third time this season with Fallon Sawyers-Grandon in third place. This performance was enough to clinch the U10s Order of Merit title for Fallon so making the long trip from Swansea Bay worthwhile. 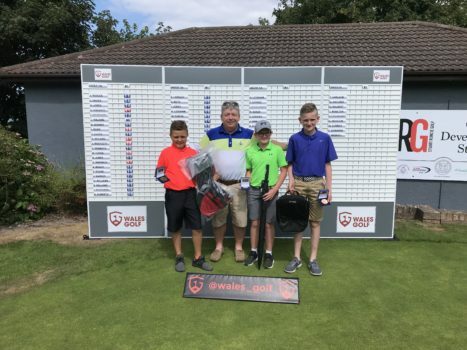 Top spots in the U8s have been shared all season by Milford Haven’s Tomas Carlson and Abergele’s Gethin Hatcher, but this week Danny Wignall from North Wales GC produced a stunning round in his opening Junior Tour event to secure first place. Gethin playing at is home club was just a point behind with 58 and Tomas in third with 57. Tomas’ exceptional Junior Tour season including three wins, a runner up spot and this weekend’s third place see him comfortably take the U8s Order of Merit title. Chairman of Wales Golf, Val Franklin, added, “We have been thrilled with the success of the Ping Welsh Junior Tour, now in its third year. With the regional qualifying events completed for 2018, twenty players in each of the four age groups, based on their position in the Order of Merit, will be invited to take part in the end of season Tour Final at Wrexham Golf Club. From left to right: William Pontin; Pyle & Kenfig, Abergele GC Captain Dave Williams, Ethan Langley: Rhondda, Harry Ledsham; Mold.